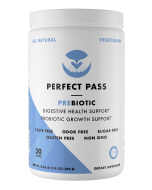 Improve your digestion fast, with safe, easy to take good bacteria or probiotics. 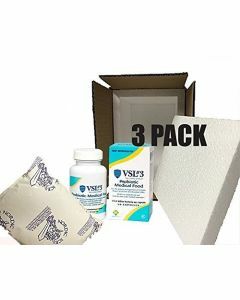 VSL#3 Has been widely used for over 15 years and is recommended by 8 gastroenterology associations, including the American College Of Gastroenterology and Triennial Yale/Harvard workshop. Recommended by physicians nation and world wide. VSL#3® capsules by Alfasigma is a probiotic dietary supplement that assists in the dietary management of Irritable Bowel Syndrome IBS, Colitis, pouchitis, or ileal pouch. VSL#3 has very high concentration of good bacteria and their specially selected combination of strains adds to how potent VSL3 is. Consume 1-16 capsules daily or as directed by your physician. VSL#3 should not be mixed in hot foods or hot drinks as heat can destroy the bacteria. Once added to food or cold drinks, VSL#3 must be consumed immediately. VSL#3 should be kept in the refrigerator, but can be left at room temperature for up to 2 weeks. VSL is now dairy free. VSL#3 is a patented combination of live lactic acid bacteria probiotics that have been cultivated, freeze-dried and mixed in high concentration (hundreds of billions per gram). VSL#3 is the probiotic that has been proven in clinical studies to be effective in serious gastro-intestinal disorders, and in particular in the management and preventions of pouchitis. Pouchitis, an inflammation of the small bowel reservoir or pouch, is the most frequenet long-term complication following colon removal and pouch creation surgery for ulcerative colitis. VSL#3 has the highest possible concentration of bacteria. Each packet of VSL3 contains 450 billion live lactic acid bacteria. This high number is necessry to ensure the establishment of lactic acid bacteria in the gut andf trigger the desired effects in the intestinal tract. functioning of the human gastrointestinal tract is well recognized12-15. Several studies demonstrate that patients with IBS, UC or an ileal pouch have decreased luminal concentrations of lactobacilli and bifidobacteria compared with healthy individuals16-23. Patients with IBS, UC or an ileal pouch may benefit from consuming high levels of probiotic bacteria so as to maintain the appropriate quantity and balance of beneficial microflora in their gastrointestinal tract. This is particularly important for patients with UC or an ileal pouch in view of their frequent and often long term antibiotic treatment. Hence, IBS, UC and ileal pouch patients have a distinct nutritional requirement that differs from normal individuals. 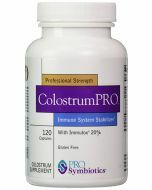 Daily consumption of high levels of probiotic bacteria is needed to maintain adequate and balanced colonization in the gastrointestinal tract, and this cannot be achieved simply by modification of the normal diet. How long do you need to wait for VSL#3 to work? Usually, VSL#3 takes about a 1 week to establish in the digestive system. VSL research study shows that maximum bacterial colonization of the digestive tract occurs in 20 days. This high level of colonization will maintain if you continue take VSL consistently on a daily basis. If you disrupt daily intake, the strains in VSL#3 are able to survive in the gastro intestinal system for up to 3 weeks. How does VSL#3 differ from other probiotic products on the market? 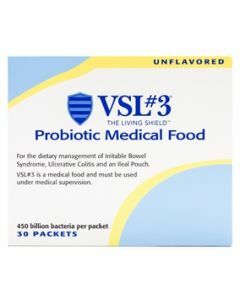 VSL3 is a high potency probiotic formula made up of eight different strains of live bacteria that have been carefully cultivated and mixed in a ratio that maximizes the probiotic content. The highest number of bacteria and the unique choice of strains gives VSL3 a dramatic degree of potency. It has been said that VSL#3 capsules are about 10-100 times* more potent than the average probiotic. VSL3 is the probiotic proven effective in controlled clinical trials. VSL3 contains 8 beneficial strains acting like a 'Living Shield'. When comparing other available products, you should consider the number of strains and the total bacteria. VSL3 is reasonabley priced when considering the number of lactic acid bacteria you get per dollar. What is the Recommended Daily Intake? Adult intake: VSL#3® is designated for the dietary management of UC, an ileal pouch and IBS. Daily intake ranges from 225 to 3,600 x 109 CFU. Consuming VSL#3® has been shown to aid in the dietary management of UC in both adults and pediatric patients. VSL#3® has been found useful following IPAA surgery for UC. It has also been shown to reduce symptoms in mild pouchitis, and to reduce relapse of pouchitis symptoms following antibiotic-induced remission. VSL#3® may also decrease bloating and flatulence in patients with IBS. Pediatric Intake: VSL#3® is also designated for the dietary management of UC or IBS in children. VSL#3® was the first probiotic medical food to be utilized in a pediatric, randomized, placebo-controlled, double-blind, crossover trial that suggested the safety and efficacy of a highly concentrated mixture of probiotic bacterial strains in active UC and demonstrated its role in maintenance of remission4. For children, the amount consumed per day varies by age, weight and clinical study6-11, 55. VSL#3® consists of live, lyophilized bacteria. It should be stored at a cold and stable temperature. VSL#3® products if unopened and stored under refrigeration (36-46°For 2-8°C), are guaranteed through the “Best if used by” date. VSL#3® can be stored at room temperature (77°F) for up to 2 weeks without having a major effect on potency. If it is left at room temperature for longer periods of time or exposed to excessive heat, the number of beneficial bacteria in VSL#3® can become greatly reduced. Studies have not been conducted on the effects of freezing on VSL#3®. But repeating changes in temperature such as freezing, refrigerating and refreezing can stress the bacterial cell membranes, which are vital to the life of the bacteria. Therefore, VSL#3® can be stored until needed in the freezer, but once it has been frozen and then thawed, it should then be maintained at refrigeration temperature and not be refrozen. -$3.60 discount on buying this offer.